Bellevue megadeveloper Kemper Freeman and other longtime light-rail opponents are supporting a slate of candidates in this November’s Bellevue City Council elections that, Freeman hopes, will stymie plans to build light rail at-grade through downtown Bellevue (where most of Freeman’s developments are centered). Freeman, along with members of the anti-light-rail Eastside Transportation Coalition, has given thousands of dollars to the four candidates—more than $3,500 altogether. In an interview with PubliCola, Freeman made no bones about his desire to halt light rail construction or at least to force light rail underground through Bellevue or, alternately, away from the city center. “Unless you want to just wipe Bellevue off the map, and that may be what some people want, you won’t support” putting light rail on the surface through downtown Bellevue, Freeman says. Light-rail opponents, having lost their battle against rail in general, are now concentrating on influencing light rail’s route through the city: If light rail goes through downtown Bellevue along Bellevue Way, they want it underground (a change that would add as much as half a billion dollars to the cost); and if they can’t get it underground, they want it moved away from neighborhoods and businesses, to the Burlington Northern Santa Fe right-of-way just east of I-405. Read the rest of the story at Publicola. What’s funny is that most transit fans in the region would likely prefer a tunnel through Bellevue, though it is widely recognized that Bellevue would have to pay for the extra cost of a tunnel option. However, candidates that support the BNSF alignment not only hurt near-term ridership but also long-term re-development potential. Light rail will improve downtown Bellevue, and hence his empire. Is his head really that deep in the sand? Yes, it actually is. Freeman appears to be a true believer in the absolute supremacy of auto transport. Given this, it is certainly rational that Freeman would oppose a surface alignment, as that would require the removal of vehicle capacity on the streets where Light Rail goes. It would also result in construction impacts which could harm his businesses in the short run. Put yourself in the position of someone who truly believes that light rail has absolutely no value whatsoever, and Freeman’s position starts to make all sorts of sense. I, of course, agree with most on this blog that light rail will be a boon for downtown bellevue, but Freeman doesn’t see it that way. Nonetheless, if his antics can help get the line buried through downtown, we’ll all be better off. You have to admit that it would be a nightmare to navigate downtown Bellevue if they start laying track, moving utilities and all that stuff if they do the surface option. I live in Snohomish County and I much prefer the tunnel option. It is less disruptive and probably faster too since taffic won’t be an issue. Freeman probably sees the same thing. He might not like rail but he certainly doesn’t like the traffic impacts. Who would? I assume he is a Bellevue resident? You have to admit that it would be a nightmare to navigate downtown Bellevue if they start laying track, moving utilities and all that stuff if they do the surface option. How do people not realize the viaduct would be the same (with a non-tunnel option)? 1. If they implement a lid on DT bellevue to help pay for the tunnel, as DT Bellevue’s largest land owner he would have to fork out a lot of money. 2. Currently, Freeman and a few other landowners have a sort of oligopoly on high-rise potential land as well as high-rise developed land on the Eastside, and because of that they are able to charge much higher rents. 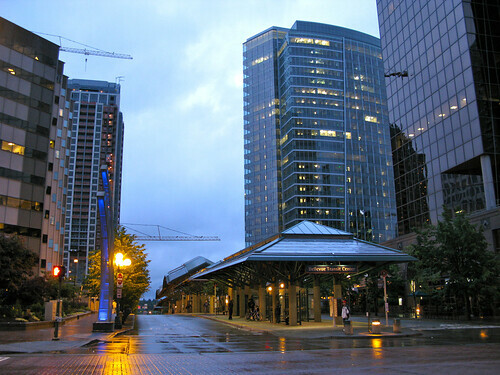 If light rail spurs much more development and encourages Bellevue to zone more land high-rise, he may lose out on rent. Think about how the opening of Neiman Marcus at the Bravern makes Bell Square less valuable, same think could apply for more high-rises. Even having said that, assuming his reasons for opposing light rail are financial and not ideological (we all know they are, but just a mental exercise here), I think he’s miscalculating. 1. DT Bellevue has come to have terrible traffic: last time I drove around there (admittedly, a long time ago) it took 15 minutes to get from I-405 to Bellevue Way (or whatever that street is called) on 8th street. The distance is a little under 3/4 a mile, so that’s a net of 3 miles per hour. Light Rail is the mostly likely possibility for improving the movement of people through that area and thus in and out of his businesses and office towers. 2. His undeveloped (parking lots) and under-developed land would be more valuable with an up-zone, which really is predicated on light rail. Freeman may have to contribute most to an LID for a Bellevue tunnel, but he would probably be the person who would benefit most from an effective light rail allignment. If he were interested in money instead of auto-centric ideology, he should back it. NE 8th St. is the wrong way to get between I-405 and Bellevue Way. NE 4th, NE 10th or NE 12th is much quicker. Not necessarily. If his land is already completely developed and the stations end up all near 405, he may benefit less than other land owners. I still think he’s an idiot, and should be forced to pay for the LID as just deserts. It would be only more funny if Bellevue upzoned the areas nearer to the freeway and new towers blocked all his Cascades views. Unfortunately, his waterviews are likely all safe. If his land is already completely developed, he has to invest less to get higher rents. If you assume that light rail drives a re-zone, then he’s already developed land won’t profit as much from the re-zone. He’s got three or four of the five tallest buildings in bellevue already. If bellevue zoned to DT Seattle zoning there, he wouldn’t tear those down to build taller, so someone else would get the benefit. IT’s an unreasonable argument, I posted it to show how spurious even the most reasonable dollars-and-cents arguments against light rail there are. If you think of cars as “personal transport” that you come and go exactly when and where you want to, then it totally fits the Freeman Kemper view of the world. That in fact everybody can’t do it all at the same time, which results in the current traffic mess we have doesn’t seem to faze him. It’s kind of like the Ann Ryan fans of utopia that don’t see that it doesn’t seem to work that way in the world we actually live in. Bellevue should pay for the additional cost of a tunnel by taxing downtown businesses that will benefit from the line. I agree that Bellevue should have to pay, rather than force the rest of the Eastside into some strong-armed sub-area robbery, but technically if you want to tax the business that benefit from the line the most, you’d have to wait until the line opens. No you could do a local improvement tax to fund the tunnel the way the S.L.U.T was funded. The trouble is it’s a vote by property owners and Freeman K owns a lot of the property along the route. I disagree that Bellevue should bear the full difference in cost for a tunnel versus a surface alignment. Grade separation is a benefit to East Link as a whole, since slow going through downtown Bellevue means longer commutes between Redmond and Seattle. Plus a big train / car snarl on NE 8th could back up onto 405, so it’s arguably beneficial to other Eastside cities like Kirkland that the line through downtown Bellevue is grade separated. The City of Bellevue has been very forward-thinking about transit, and it’s not their fault that the best technical solution is also the more expensive. Should the city pick up a share of the extra cost? Definitely. It just seems punitive to force them to pay for the whole thing. It would be more equitable to have the subarea pitch in. I was being a bit subtle here. Who’s the big east side business owner in town? Kemper Freeman. If he really wants this then he’ll be willing to pay, right? Right? I agree with pete – rail is good for business. People will have better access to his properties and commercial tennants. Isn’t that a good thing? And this boon to his business will be paid for by the public. Why would a busines many shun a free benefit to his busines? It doesn’t make sense. It makes sense when you figure out where he’s coming from. I love this video. Kemper Freeman’s name should always hyperlink to that! He’s so giddy about the automobile! Did you see the typo that introduced the video? “End Gidlock Now.” I’m not making it up. Yep, we saw it. Hence my (lame) joke. I think you contextualized it enough to eliminate your worries. After all, you didn’t compare their motives or tactics. People in Bellevue don’t ride buses. They drive their luxury SUVs and don’t see any reason for an alternative. In fact, they may not even know what a bus is. When they see one they probably just assume its some sort of private charter. People in Tacoma never visit Bellevue. Why would you go to Bellevue when you can just go to Seattle? I have to say I agree with them. Actually Dave, quite a few people in Bellevue, especially commuters, ride buses regularly. Many of the routes going to/from Bellevue are at full capacity on a daily basis. Maybe you should try coming to the Bellevue Transit Center during peak hours some time and you will see many of the routes leaving Bellevue are standing room only including the 532, 535, 550, 564 and 565.
other Bellevue routes that attract heavy loads are routes 230, 245, 253, 271, 555, and 556. other eastside routes that attract heavy loads are routes 212, 216, 218, 225, 229, and 255. Dave, your comment is particularly dumb. Dave, that’s bullcrap. I live in South Bellevue and regularly commute through Eastgate PR and travel occasionally through the Bellevue TC. No shortage of bus riders there. Dumb comments like that make pro-transit wonks like us look bad. Try riding the 212 to Eastgate or the 550 to Bellevue during rush hour. They’re packed like sardine cans even with ten-minute headways. Plenty of people in Bellevue ride the bus because there are lots of middle income families in the Bellevue area. They just happen to be overshadowed politically by the Freeman-loving, Mercedes-driving elites. As a Bellevue resident and Microsoft employee, I take offense. With a modification to hand-driving only, I legally can drive. BUT: Me & my wheelchair CHOOSE to ride the 230 to/from work. There probably isn’t the ridership to justify a direct Bellevue-Tacoma bus, but there are several two-bus options. I think if you build it they will come. Especially if it also stopped in Overlake. I suspect the issue is more one of the Pierce sub-area not having the funds to pay for such service (and other routes being higher priority). No, lazarus is right. Tacoma isn’t really the beginning point, it’s not where the residential is. Sounder gets very few Tacoma-origin trips. The 564 and 565 cover most of the potential ridership already. Well, the 2nd and 4th largest aren’t linked either (Spokane and Vancouver). :) Sorry for the snark. If there were the ridership potential, seems like they would have done it by now. There is the Empire Builder between Spokane and Vancouver. Maybe Amtrak can run a Bellevue-Tacoma line. That would be hard now that the BNSF corridor has been severed at I-405. Oh wait, it could go via Everett. What’s that, the 5th largest city? I am beginning to sense a network forming… maybe it can pass through the cities in descending order of size, starting with Everett, then Vancouver, Bellevue, Tacoma, Spokane, Seattle. I got that wrong. I’m thinking that’s more of a Sounder thing. Bellevue and Tacoma are also pretty far from each other, with several transit centers or potential transit centers in between. Currently you can take the Bellevue-SeaTac bus and transfer to the SeaTac-Tacoma bus. Both are ST Expresses. There is no direct road from Bellevue to Tacoma; the most likely routes are 405/I-5 or 405/167/18/I-5. The title of this article cracks me up. In the same way as a “Dog Bites Man” headline might, or “Mike McGinn Attempting to Shape Future Viaduct” headline. That Kemper’s really a one trick pony. Yeah, poor form on my part. It was surprisingly unintentional! The other headline on Publicola was “Freeman Backs Anti-Light Rail Slate on Eastside.” I felt like that was a slightly inaccurate headline — for a solid report — since Freeman was funded based on alignment and not whether the new council would kill rail. WTF? His head is so far up his SUV’s tailpipe it’s amazing. Let’s be honest. During construction, downtown mobility is going to be severely curtailed whether the alignment is at or below grade. Off topic: Larry Phillips was interviewed about the Metro Transit audit today: http://kuow.org/program.php?current=TC (that link may not work tomorrow). One thing I hadn’t heard of before was the possibility of raising paratransit fares. Let’s just all hope that this will work itself out as Bellevue paying for its own tunnel – that would rule, and it would help get Link to Redmond since ST money wouldn’t cover the increased cost of a tunnel, if I’m not mistaken. ST doesn’t have money right now to cover the increased cost of the tunnel, so having Bellevue pay for it wouldn’t help get Link to Redmond. I will again state that people that spend tons of money at malls are not likely to be transit users. I don’t think you will see many people blow $5,000 at the Bravern and hop on the bus or light rail. Maybe someday but not anytime soon. In America the bus is for commuters and the poor, change takes time. You would be wrong, I see plenty of people in Westlake station with bags from the fancy stores in the area. When East Link is complete it will connect all of those well paid tech workers out at Overlake to Downtown Bellevue among other places. If nothing else there should be a fairly steady business to any stores selling tech toys or the sort of things one might buy for a last minute birthday or anniversary gift. While I don’t track his every public utterance, I’ve never seen or heard anything from Kemper Freeman that criticizes the present bus service in and out of Bellevue CBD. I’ve watched a few of his speeches that are seemingly comprehensive on his transportation views, and beating up on public transit generally is not there, except for Sound Transit. The Eastside Transportation Association in which his colleagues participate is on record advocating improved bus service for the Eastside. See http://www.EastsideTA.com. Freeman of course is criticizing Link generally, and is even part of taking one legal step with the State Supreme Court that would block the replacement of the ST Express Bus 550 with light rail. A lot of people I know are critical of building RR tracks on I-90, and the environmental review is still ongoing. Collecting taxes to pay for this train is not the final word, because various highway authorities are still in the loop on the decision making. We are a year away from a Federal Record of Decision on what is part of the Federal Highway System. John Niles is reminding us of the fact he’s been stuck in the same tiny, anti- mass transit echo chamber for nearly 15 years? Kemper Freeman has stated in the past that he feels transit riders are not the sort of people who shop at his retail properties. Add to that the wild and unaffordable highway expansions he has promoted in the past (widening I-5 through Seattle by 4 lanes? Really? And you think Light rail is expensive? The lawsuits alone will eat a few billion.) and I don’t think his opposition to Sound Transit is a simple matter promoting fiscal responsibility in transportation spending. No, he is anti-transit. Watch http://dl.getdropbox.com/u/39870/EGN%20Hi%20Res.wmv It’s pretty obvious. His talk about buses are just a token gesture. The personal automobile comes first and buses are simply an afterthought. Get him to throw his weight behind a Bellevue Bus Tunnel (a solution proposed by the ETA) and I’ll be more convinced. “Personal freedom” was the same argument Motordom used to take over the streets from pedestrians back in the 1920s (Norton, Fighting Traffic) when they successfully reframed the problem from “safety” to “freedom”. and the people who still equate the car with freedom are the ones who are a complete slave to their car for any and every task in their life. I wonder where Kemper lives. “The Option of Urbanism” has a very interesting model of American metropolis geography. Every metropolis has a “favored quarter”, a direction from the central city where the most prominent businessmen live, which gets the most infrastructure, and (since the 80s) where the most jobs are created (in Pugetopolis it’s the Eastside). The favored quarter usually has two freeways eminating from the central city and a ring road or peripheral freeway joining them (I-90, 520, 405). This forms a triangle inside which said businessmen generally live (Bill Gates). Their offices are generally located such that one of the freeways directly connects the boss’s house to the office (Microsoft). The office is often further from the central city than the house so that the boss can reverse commute (again Microsoft). No regard is paid to the commutes of the workers, for whom public transportation doesn’t work since it’s mainly designed for commuting to the central city. Of course this doesn’t take into account very recent developments (the new interest in rail and TOD), but Leinberger shows how it applies to city after city. I suspect Kemper lives near Bellevue Square since his kind lives Medina-ish, so he probably doesn’t have much of a commute. But his attitude fits in perfectly with this model. BTW to give the Devil it’s due, I must say I like some of the bus service improvements the ETA proposes. However I suspect at least some of the routes they propose would have fairly low ridership. There is a reason some of those areas don’t have very good transit service and it isn’t all due to inertia on Metro’s part. Typical distortions from John Niles, trying to defend the guy who signs his paychecks. Apparently Mr Niles wants to ignore the video Kemper Freeman produced (featuring a Kemper Freeman lecture). You know, the video where he equates ALL public transit with communism and infers the terrorists also want to drag us out of our cars. John Niles has a right to speak as many mistruths as possible when he tries to stop the next phases of light rail expansion – including those already approved by voters. But he also has an obligation to avoid telling monster lies about Kemper Freeman’s supposed support for buses and bus ‘rapid’ transit. Bellevue Square is also a major employment center for those earning working wages. Take a gander as a bus unloads at a stop nearest Bellevue Square — then follow the crowd into the mall. Methinks they’d be frequent users of light rail. Because they live where? Downtown Seattle? Mercer Island? Surrey Downs? More likely Crossroads which Link doesn’t serve but it’s amazing how the non-Bellevue residents picture the Eastside; like it’s going to be just like Seattle since they know no different. Also Totem Lake, Montlake Terrace, Renton, Kent. According to the ETA roughly 15% of Downtown Bellevue workers live in Snohomish County, another 15% in South King County. I presume at least some are those earning working wages. Thusly, I’m outed. I have never lived in Bellevue, ’tis true, but I did work there for 10 years while living in Kirkland. I relocated out of the area 20 years ago. Are we still friends? I have watched that video from Kemper’s past campaign several times; I recommend everybody watch it. It doesn’t exactly reflect my point of view, but I’m sympathetic to his message. Freeman’s opinion as a Republican business type simply reflects the market share that transit achieves in Puget Sound region, about 4% to 5% now and on into the future. He says on that video that transit is very important for serving that slice of the market. As he knows and you know, this region’s commute trip market share on public transit is best in America west of the Mississippi River except for San Francisco area. There is nothing in that video about cutting back on Metro’s bus transit. Is the current government planning for more transit around here going to improve its market share? Is Sound Transit’s $2 million per day in tax collections going to make mobility better? Not according to the Puget Sound Regional Council, which recently published a draft Metropolitan Transportation Plan alternative for 2040 including ST2, ST3, and ST4 expansion, and putting pay-by-the-mile charges on every expressway and arterial in the region. Over 50% of government transportation revenue would go to transit. Yet one of the best regional computer models in America was unable to show a doubled transit share from today, that is, reaching 8% in 2040 from 4% today. Can’t do it. Creeps up to 5.2% after spending billions. With billions going into urban railroads, I testified that PSRC damn well ought to write a plan for 2040 that forecasts doubled transit market share, or explain why it cannot in detail. Former SecDOT Doug MacDonald is calling for the same transit market share goal. John Niles lives in a world of detached numbers nobody cares about. Which is why he ALWAYS loses. Kemper’s fake support for buses parallels Niles’ fake support for BRT – almost perfectly. Of course Niles is sympathetic to Kemper’s “one person per car” mantra. Thanks for the instructive stats. My anecdotal observation of an ST bus from Seattle carried the assumption that if this particular bus works for you now, light rail will work for you in the future. Downtown Bellevue is a regional job center that draws workers of all kinds — managerial, service and office — from throughout central Puget Sound. Thus the need for a comprehensive, reliable regional transit system (Remember: Central Link is just the start). The mall owner in question appears unaware or unconcerned that he is making it more difficult for employees to get to the jobs that make his empire go.